Welcome a fresh year with Uptown’s most important New Year’s good fortune tip: Deposit as little as $30 to play with the luckiest bonuses and a Free Spins Pack! Ring in a lucky 2017 with instant good luck and wins when you play with a 1st 100% Match + 50 Lucky Spins, attract even more fortune your way with a 2nd 150% Match + 100 Free Spins and continue making your own New Year prosperity with a 200 Free Lucky Spins Reward! Make 2017 boom right from the very start and until the end of January with our duo of lucky bonuses plus Free Spins pack! 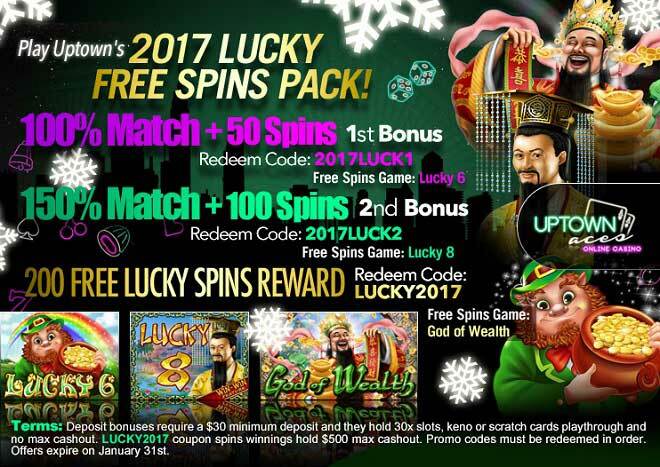 200 Free Lucky Spins Reward! Deposit bonuses require a $30 minimum deposit and they hold 30x slots, keno or scratch cards playthrough and no max cashout. LUCKY2017 coupon spins winnings hold $500 max cashout. Promo codes must be redeemed in order. Offers expire on January 31st.